Did heart drug makers withhold data from leading medical journal? Lawyers for patients who are suing two big drug makers who market a popular blood-clotting drug say the companies withheld important information from a letter published recently in a major medical journal. An article in The New York Times today says lawyers suing Johnson & Johnson and Bayer over the safety of the blood thinning drug Xarelto are calling out an analysis by Duke researchers published in The New England Journal of Medicine. Their analysis showed that problems with a device used in clinical trials of the drug, to test blood for clotting, did not change the drug trial's results. 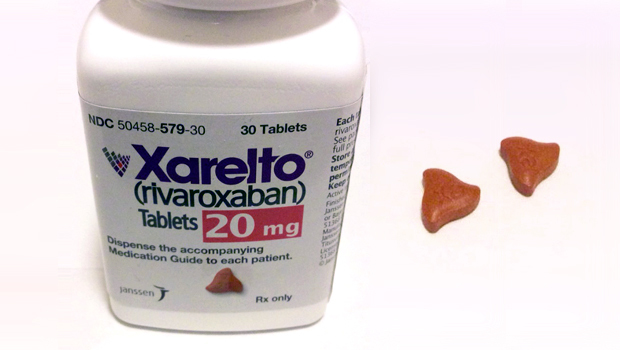 But according to The Times, the lawyers said the Duke researchers left out key research information that might have affected clinical trial results that compared Xarelto (rivaroxaban) to warfarin, another, older blood thinner. The original concern with the Xarelto clinical trial was that a device used to test the effectiveness of the drugs on blood clotting was faulty and made Xarelto look better compared to warfarin. The device was later recalled. The Duke Clinical Research Institute ran the three-year clinical trial, which included more than 14,000 patients and led to Xarelto's FDA approval. It reanalyzed the results after questions were raised about the faulty device and whether the study's findings held up. But now, it appears, according to The Times, other information might have been withheld that should have been published in the follow-up analysis. During the course of the trial, about 5,000 blood samples were taken from a small number of the study patients and sent off to a central laboratory. "I think it was done so the trial investigators would be confident the test results being produced locally were pretty accurate. I believe that's why they took random samples and sent them out," said Dr. Kirk Garratt, associate director for the Center for Heart and Vascular Health at Christiana Care Health System, in Wilmington, Delaware, who was not involved in the Xarelto clinical trials. During later hearings, the drug companies did not offer up the additional information, even though it was available, the lawyers are suggesting. "It doesn't say it was hidden, and no one denied it, but no one stepped up," Garratt told CBS News. The Duke researchers said in a previous statement that they had conducted research separately from the drug companies. The medical journal editors who published the analysis told The Times that they did not know about the lab data until last Tuesday, when a reporter asked them about it. "At the time we published the letter, we didn't know that it existed," Dr. Jeffrey M. Drazen, editor in chief of The New England Journal of Medicine, told the paper. In a statement provided to CBS News, the journal said: "The editors do not believe that information was withheld by the authors." Although the missing data raises questions, Garratt says he remains confident in the overall safety and effectiveness of the drugs. "I tend to believe that these drugs, rivaroxaban and other drugs like it, are very good medicines. We've already had several years experience with them and they're very good," said Garratt. "No drug is perfect but there's nothing that's come up with these in clinical practice that makes me believe these trial results were misleading." More than 13 million Xarelto prescriptions have been written in the U.S., making it the most prescribed blood thinner in its class in the country. Kristina Chang, a spokesperson for Janssen Global Services, said,"Janssen had no influence over the DCRI reanalysis data submission to the NEJM, and no interaction with NEJM, as we recused ourselves from the independent DCRI reanalysis. Our greatest responsibility is to those who rely on our medicines. We have stayed true to this commitment with Xarelto and will defend vigorously against any claims to the contrary."